More mixed sandwiches. Today a chicken salad (from Trader Joe’s) and silverside and labné. The chicken salad is particularly good. The chicken salad was $3.99 and we shared one third, or 67c per serve. Lunch today was satisfying for $1.93 per serve. Tonight was the monthly LACPUG meeting, with pizza following, where we each contribute $5.00 toward the pizza. We decided to give our toasted sandwich maker one more try before deciding to send it back. Once again it leaked out and made an incredible mess so that appliance is now packed on its way back to Amazon. Our sandwiches were okay. Another ham, mustard and cheese, and a silverside and spicy labné. 12 slices of yoghurt cheese are $4.79 and we shared one or 20c per serve. Lunch today was hampered by the fact the sandwich maker holds too little filling to make the sandwiches tasty. Lunch today cost $1.33 per serve. Pork Shoulder Chops are often challenging because they require a slow braise to bring out the best. Fast cooking would make them very tough and not enjoyable. We tried a new recipe with a vinegar braise that turned out very well. The chops were tender and tasty. We dropped the sugar and water for slightly less sweet approach. 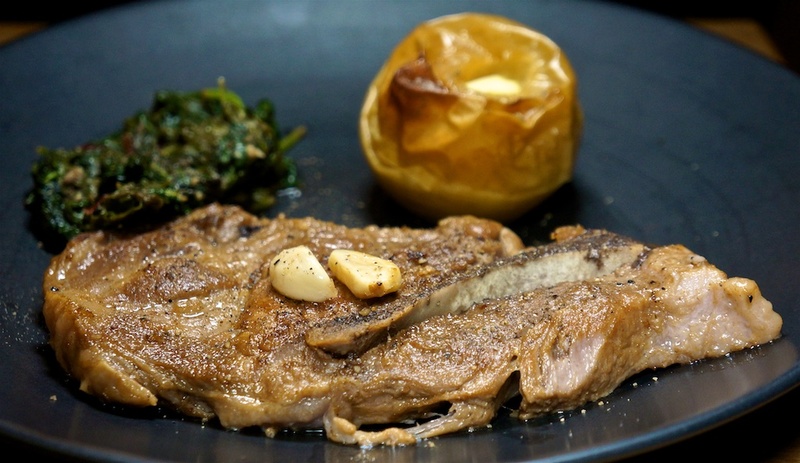 We paired it with wilted greens flavored with garlic and anchovy, and a baked apple. Add 45c for garlic and anchovy. Dinner tonight was tender, tasty and had a good variety of flavors. The garlic in the braise linked to the garlic in the greens in a pleasing manor. A good meal for $8.38 per serve. Another Burbank Monday had Foodie Philip at In and Out Burger for a Double Double Animal Style for $4.27. 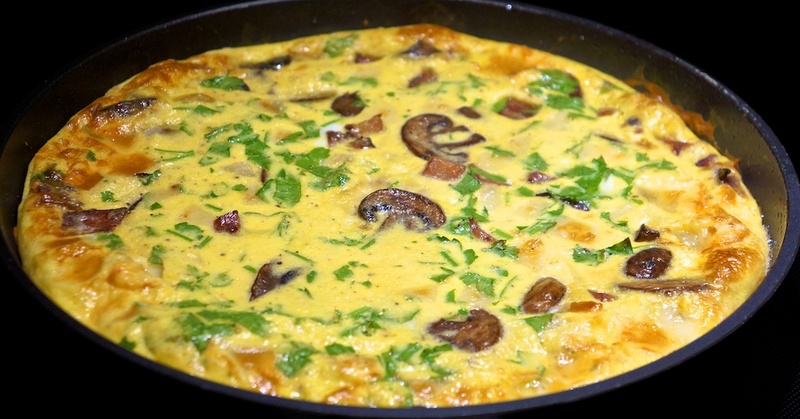 Tonight’s use of leftover ham is a ham, mushroom and emmental frittata. Eggs are 55c each or $1.65 per serve. Dinner tonight was tasty. We could have served three with this frittata but with two it was $7.60 per serve. Obviously, we’re still eating through our enormous store of baked ham so we paired it with an avocado and some mustard aioli for a great sandwich. Add 10c for mustard aioli. We’ve learnt that ham and “fat” go together nicely on a sandwich: either the brie or avocado work well to make a delicious sandwich for $1.13 per serve. A simple meal of Trader Joe’s Bavarian Bratwurst, crash hot (purple) potatoes and steamed green beans. We used the last half of the $2.99 packet of beans between the three of us, or 50c per serve. Dinner was simple and tasty for $2.55 per serve. When thinking about lunch we decided we had a hankering for a Bahn Mi from Pho Saigon 1, which we very much enjoyed for $8.50 with tax. Loosely based on a Salade Niçoise, we repeated our smoked trout version, with more of the purple potatoes we’ve been enjoying lately. The purple potatoes have the softest flesh when cooked. Foodie Greg used the oil from the trout to carry the smokey taste into the dressing, and, along with anchovy, give the dressing tremendous umami. Add 35c per serve for the dressing ingredients. 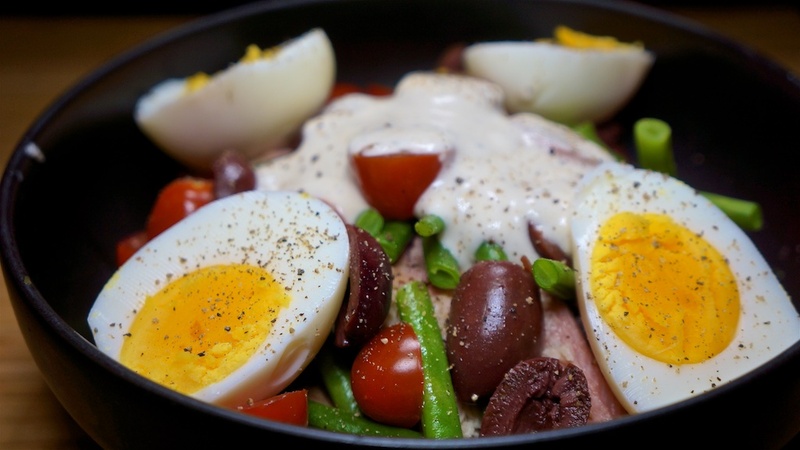 Each time we have this I believe it to be the best nicoise salad we’ve ever had. The smoked trout costs about the same as good canned tuna but has a lot more flavor. Very good for $6.43 per serve. Still eating through the ham we balance it with other sandwiches for variety. Today we repeated the Ham, Brie and Watercress, but substituted silverside for pastrami on the other sandwich. Lunch today was definitely above average, for $2.90 per serve. 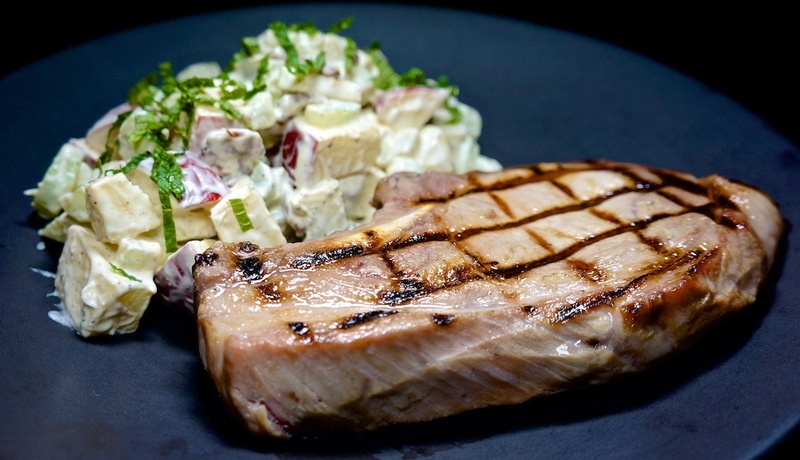 One of our favorite meals each month is the thick cut pork chops from Prather Ranch. Add 15c for mayonnaise and labné for the dressing. Dinner tonight was excellent: every bit as good as a restaurant version at $30-$40 a serve, but cost us only $11.84. As we we heading for a Thanksgiving feast with friends, we shared a single sandwich ahead of time. The avocado was 4 for $2.99, or 38c per serve. Lunch today was definitely above average, for 72c per serve. With a Thanksgiving feast contributed to by so many people, it’s impossible to calculate a per-person cost. We contributed a creamed corn casserole (with a little white truffle oil) that was delicious and popular. With substantial amounts of ham left over, we – obviously – had a ham sandwich. We paired it with brie remaining from the night before, and some watercress for a fresh crunch. It was spectacular! The other sandwich paired garlic hummus with pastrami. It was good, but not as good as the ham and brie! Lunch today was definitely above average, for $2.98 per serve. 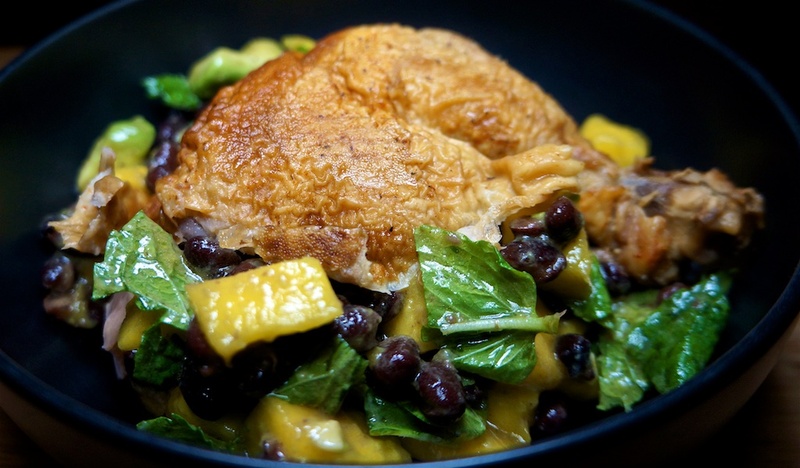 For dinner we finished the supermarket chicken from earlier in the week and paired it with a mango, avocado, black bean and mint salad. The salad was definitely the highlight of the meal, which was $4.00 per serve. Today’s sandwiches: avocado and tabouli and pastrami with hummus. Lunch today was tasty for $2.29 per serve. We had guests for dinner and wanted to prepare something “American,” so we decided on baked ham. While cold sliced ham is part of the Summer Christmas tradition in Australia, baked ham is unknown, so was a good choice for our Australian visitors. We paired it with Nigella Lawson’s Double Potato Halloumi Bake. Garlic adds 5c per serve. 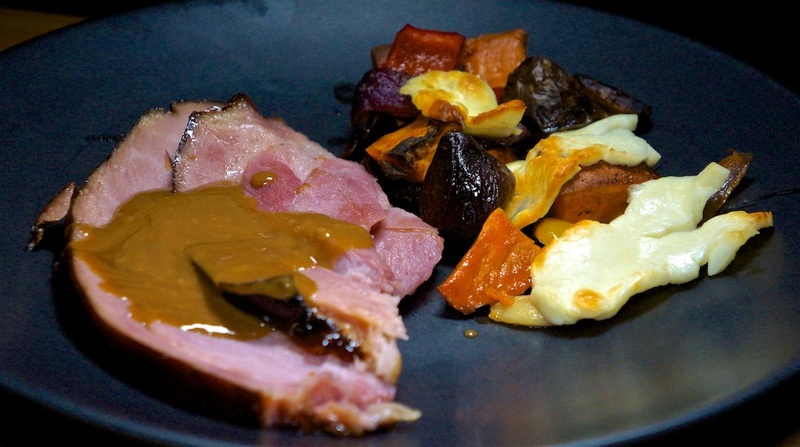 Dinner tonight was an excellent example of a roast dinner: moist baked ham and perfectly roast vegetables for just $3.14 per serve. If it’s Monday, it must be Burbank and an In and Out Double Double Animal Style for $4.27. We returned to an old favorite: Lemon Chicken Orzo Soup but substituted quinoa for the orzo, which worked fine and is a way to avoid carbohydrates in the evening. Add in 15c for the other seasonings, etc. Dinner tonight cost $2.44 per serve!